Loisirs Littéraires au XXe siècle (English: "Literary leasures in the 20th century") is the title of an illustration from the story "The End of Books" by French writer Octave Uzanne and illustrator Albert Robida, a story about a post-literate society in which readers have become 'hearers', consumers of audio books. It was published in the collection Contes pour les bibliophiles (1895). The illustration depicts a female reader of the 20th century, imagined by Robida, who is listening to "12 poètes assortis" (twelve assorted poets) on a balcony overlooking a future city. Loisirs Littéraires au XXe siècle (right, English: "Literary leasures in the 20th century") is the title of an illustration from the story "The End of Books" by French writer Octave Uzanne and illustrator Albert Robida, a story about a post-literate society in which readers have become 'hearers', consumers of audio books. It was published in the collection Contes pour les bibliophiles (1895). 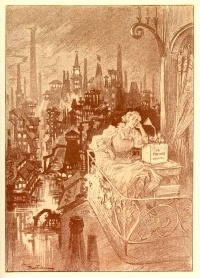 The illustration depicts a female reader of the 20th century, imagined by Robida, who is listening to "12 poètes assortis" (twelve assorted poets) on a balcony overlooking a future city. Unless indicated otherwise, the text in this article is either based on Wikipedia article "Loisirs Littéraires au XXe siècle" or another language Wikipedia page thereof used under the terms of the GNU Free Documentation License; or on original research by Jahsonic and friends. See Art and Popular Culture's copyright notice. This page was last modified 06:46, 4 October 2013.